Yesterday we woke to blue skies for the first time since we have been in Ireland. After dropping my son, Simon, off at camp, I set out to explore the local beach again, hoping to find a place to dance. Given the fair weather, there were several people enjoying the beach and I didn’t feel comfortable dancing there. Because it is exceedingly dangerous, I’ve sworn off the unprotected cliff path that departs from the east end of the beach, despite its compelling beauty. I spotted a different cliff path at the west end of the beach and decided to at least try it. This time, most of the path was set back from the cliff’s edge (with the exception of one short section) and I felt more at ease. The vast horizon was striated with deep emerald and turquoise water. Views from the cliff walk included huge rock formations topped with greenery, toppled boulders, squared green fields, rock walls and the endless crashing waves far below. Absolutely by chance, on the secluded cliff path I ran into a childhood schoolmate of the friend who is hosting us and we chatted briefly. “I think it is a little bit dangerous up here. There has been a lot of erosion lately,” she shared. I nodded and told her that I decided I wouldn’t go on the other cliff path anymore; and that I am trying to play it safe, given a number of holiday calamities. Reaching the end of the cliff path, I saw a beautiful, unpeopled beach far below. There were only sheer cliffs in front of me and there didn’t seem to be a way down, so I decided to try to reach it by way of the road. Returning, I avoided the one very dangerous section of path by detouring through a heavily prickled patch. I turned off the path and walked through a field, hoping I could avoid returning all the way to the beach I’d started at, but a wire fence that I feared might be electrified blocked my way. I returned to the beach where I’d started, then turned onto the road and tried to find the secret beach. I regretted my choice to walk, as a long section of the road was treacherous for pedestrians, but I jogged along in my flipflops, hoping to get out of the way before any cars came barreling along. I got off the road as soon as I could, then walked parallel to it through someone’s field. Again, I reached a dead end, totally blocked by impassable shrubs and brambles. Determined still, I returned to the cottage and got into the car. Driving west, I spotted a nearly concealed, unmarked road in the middle of a hairpin turn and turned onto it. The graveled parking lot was at a 45-degree angle and I made sure to engage the parking brake to the last possible “click” before getting out and gathering my things. This was, surely, the secret beach that I had seen from the cliff path. Despite the first-in-many-days blue sky, there wasn’t a single person besides me. 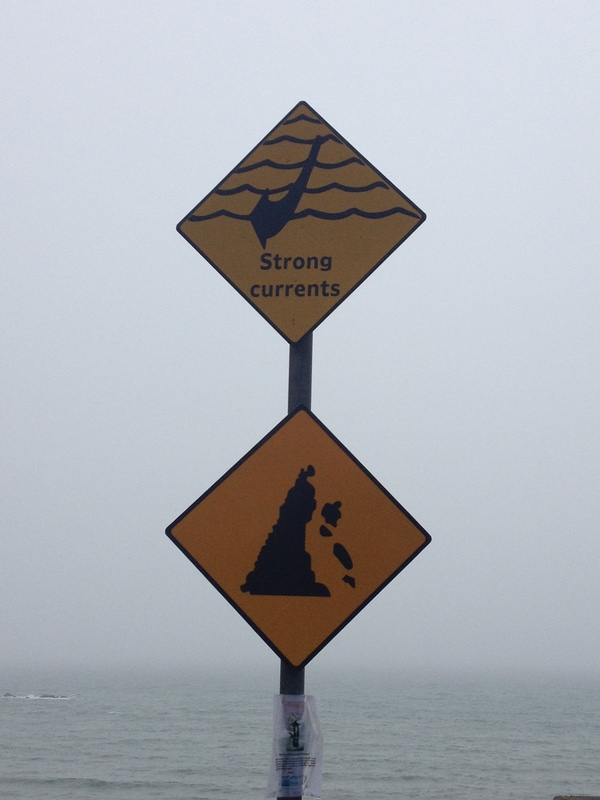 There were two graphic signs on the stairs leading to the beach below indicating falling rocks and strong currents. The stairs were made of concrete with big, coarse rocks cast inside, and were very, very steep. The first flight was relatively intact with the exception of a few crumbles, but on the second flight the stairs were severely eroded, smoothed almost to a flat ramp in some places by powerful high tides. The beach itself was remarkable. Soaring and crumbling cliffs formed its north face, with fields and endless plants and grasses visible above them. Green-topped rock islands jutted into the sea at both its ends. Rocks and boulders were cast throughout the water, causing the powerful waves to act erratically. Thankfully, it was near low tide, since based on the most recent high tide line, the beach would be treacherous at high tide, if at all accessible. On a stormy day at high tide, the waves could reach the top of the long stairs, pummeling the cliffs and beach and making access impossible. Looking up, I could see the crumbling cliffs with the turf edging hanging down like thick carpeting. I resolved once again, firmly, to stay off of high cliff paths that are right on the edges of cliffs. I wasn’t totally sure what stage the tide was at, and I eyed the sea warily. This is dragon land, without question. I ventured a short way down the beach, but chose a spot to dance that was a short sprint away from the steep, cement stairs in case high tide came in fast. I made a circle of stones for myself and also noted a cluster of round stones a short distance in front of me. If the sea reached those stones, I decided, I would call it day and head for the stairs, no matter what phase of the 5Rhythms wave I was in at that point. I broke the crusty surface of the warm sand with my bare feet. As with the previous day, moving brought tears almost immediately. I don’t know how long I was in Flowing, but I do remember that it was characterized by totally unselfconscious, fluid movement. In Staccato, I moved along the beach so I could dance on the unbroken sandy crust instead of in the sand that was already churned up by my circling feet in Flowing. I felt a tiny bit restrained. Respectful of the danger around me. Chaos, as in the previous days, was slightly restrained, also. I endeavored to release my head, but never moved with wild abandon. In Lyrical, I traced the gliding movements of birds with my hands while raised up onto my high toes, seeking sections of unbroken sand to help with lifting upward. Stillness in the first wave took its time. I let in the energy of everything around me—cliffs, ocean, sky—and it was almost overwhelming. I had the thought that if you really let in the reality of the absolute, you let in the reality of your own death, too, and let in the reality that those you love will one day die. I staggered a little at the enormity of it, and at the wondrous enormity of the landscape around me. Perhaps that is why it can be so frightening. Sometimes. For me. One of the biggest benefits of practicing independently is that I can really work with the mercurial shifts of energy as they arise. I realize that (in previous days) it made no sense to “hold” myself in Flowing. The fact is that even once I did move into Staccato, I moved back into Flowing many times. It wasn’t an all-or-nothing thing. Even when I got to Chaos, I still found myself going back to Flowing. I have often felt that I needed to keep myself in Flowing longer than felt intuitive so I could be responsible and find the ground beneath me before taking on any other investigation. Here, the stakes were different. I needed to attend to the many small subtle shifts of energy as I fluctuated between different rhythms. And in doing so, the energy of the land started to reveal itself to me. It was not what I expected, to say the least. The land or anything else about Ireland. I have contemplated my relationship to this place at length. My Irish American grandmother and aunties were very Irish identified, but as I became an adult, I related uncomfortably to this heritage. I can see how identifying strongly helped them to feel empowered (perhaps in the face of discrimation), to connect with their families and community, and to find meaning and purpose. For me, though, several generations removed, taking it on has felt more like an identity decision, not a real connection to a living culture. Before this trip, I thought, “Perhaps I could connect with this lineage in a real way, and claim this one of many parts of who I am.” I felt strong emotion in the Waterford museum in Dungarven reading about the famine, the independence movement, the seafaring history. And in talking with one well-dressed, sweet, old Irish lady, who strongly remembled my now-gone beloveds. And again, at a country fair, seeing teenagers in a dance performance—jaunty, alive, lyrical. The peasant history, the mystical strains, the aching land. I know all of this in my body. And yet I have felt distant. And more afraid here. I hope I haven’t betrayed my ancestors. My heart wants to be open, though. Perhaps there will be a breakthrough. The second wave emerged organically. Again, in Flowing I moved in linked, concentric circles, totally unselfconsciously. I found a melody that has appeared in independent practice again and again, feeling like an ancient song. Since I was totally by myself (except for one lone man in a blue jacket, a tiny dot far on the other side of the beach), I sang it with full force. It morphed into a chant—an homage to the sun that had tremendous density and power, and that persisted for most of the second wave. A thread of Stillness passed through as I danced with five black birds who soared together overhead—crossing, dipping, and gliding. The gestures of Chaos arose totally from the angles of my feet in the already agitated sand. In Lyrical, I again found lift, in my own joyful version of Irish step dancing. In Stillness, I let the waves pass through me; and at the end of the wave, I sat briefly in meditation, cross legged on a towel on the sand. 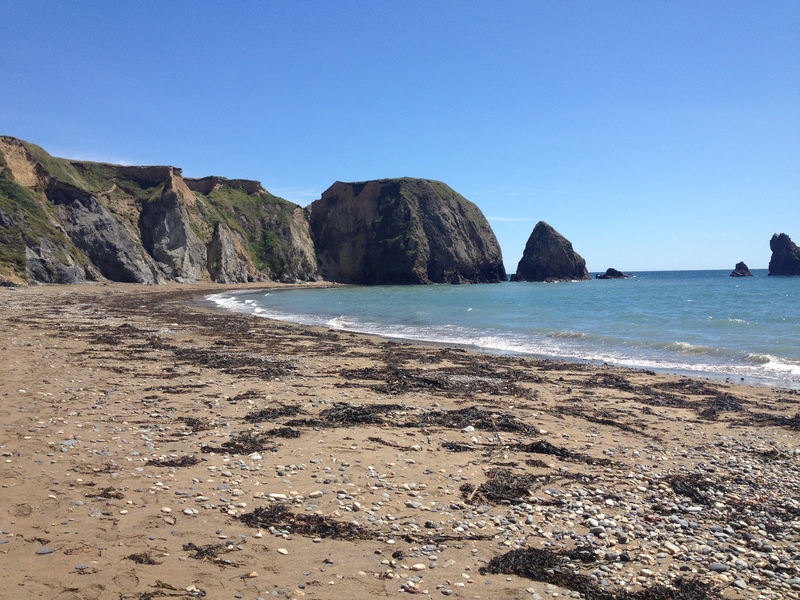 Today, I went again to this achingly beautiful, secret beach. First, I carefully checked the tide charts, since I did not want to be caught far from the stairs in a rising tide. This time, the sky was not blue, but white; and I walked west instead of east. The horizon was a vague shift in densities. Although according to the tide chart I should be ok for over an hour, I continued to fear the possibility of a quickly rising tide and watched the sea carefully. 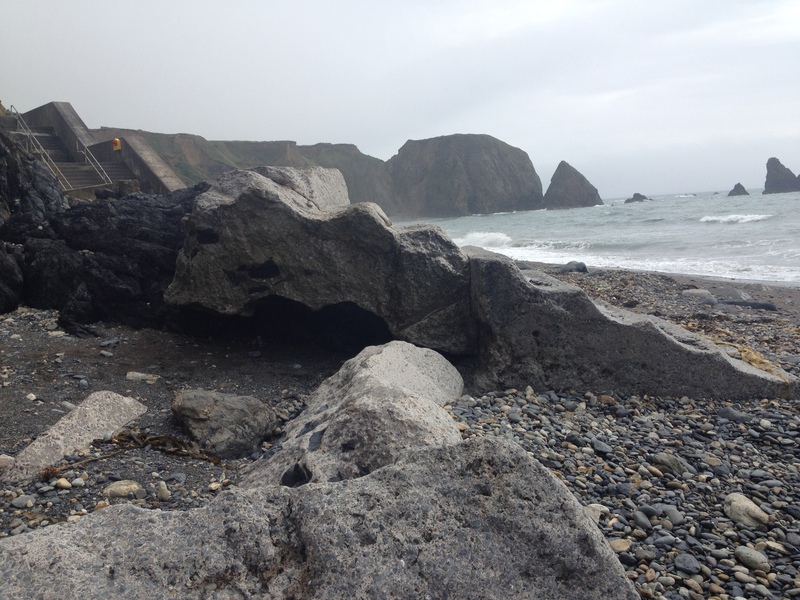 I explored at length, passing the first open beach to a set of giant rocks that would surely be islands at high tide, and on to another open beach (this one with black sand) and to another set of giant rocks. Everyone makes such a big deal about the greenness of Ireland, but here, the power of Ireland’s ancient rocks and stones presented. The stones became anthropomorphic as they began to reveal themselves, and I saw not only people, but animals and otherworldly creatures. I shot them with the phone camera like I was doing portraits; and they revealed themselves even more. I crossed paths and chatted briefly with the man in the blue jacket that I had glimpsed far down the beach the day before. I noticed that he was attractive and we chatted about the weather. He asked if I planned to swim. In keeping with my recently established personal guidelines about safety, I asked, “Is it safe to swim here?” He said, pointing, “Well, you don’t go out too far, just in that part there.” I didn’t fully take it in, believing the sea much too cold, and said, “Well, have a great morning!” and moved on. I finally had my fill of exploring, and selected a place close to the sea-damaged escape stairs. 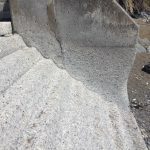 In fact, I found another cement staircase and the remains of a man-made walkway that had been totally pummeled and melted by the sea. I fell in love with it—this sturdy man-made creation that was easily felled by the raging power of the ocean. It was both humbling and heartening. Humbling because of the failed hubris of creating human structures on this wild beach. Heartening because nature so quickly reclaimed and restored itself in the face of human intervention—making our constructed foibles look like mere flashes in the pan. In Flowing, I was happy and at ease. I felt no exertion, no inertia and no self. In Staccato, I felt no urgency or strain. For a spell, I was distracted from my senses. Chaos did not so much arrive as support my intention to complete the wave. Spinning, I quickly grew dizzy on the tilted plane of the beach, then found a familiar way of moving in Chaos that I realized is just a very articulated and weighted way of spinning. I moved in and out of Chaos, Lyrical and Stillness again and again, letting the flow of energy have its way. This place, where two twisting strands of my ancestors hail from, is not what I expected. The pre-digested Ireland of cartoon leprechauns and Blarney Stone kisses is only a tiny piece of the story. In reality, it is much scarier. Much darker. Incredibly beautiful. And still, totally foreign.